The Kawasaki KZ750E is a motorcycle produced by Kawasaki from 1980 to 1982. 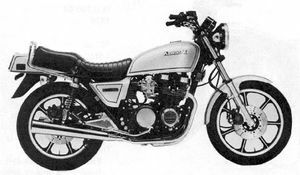 Known in the U.S. as the KZ750 and the Z750 elsewhere. 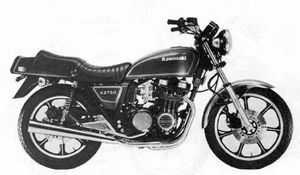 The Z750-E1 was produced from 1980-1981 where the KZ750-E1 was only made in 1980. Remarks: Light compact sports model. CV type carburetor, pneumatic front fork, damping adjustable rear shock absorbers, cast wheels, front dual-disc & rear single disc brakes. Color & graphic, low fuel warning system.